With increased adoption of social networks among the public, organizations have begun setting up profiles within social networks as a means to further connect with their audiences. Organizations who have been most successful in these endeavors take time to survey the community, understand the values and rules of engagement. In short, they pay attention to the culture and identify what is accepted before they join. When they join, the organizations who have had success within social networks remember that this isn't a place for traditional public relations tactics but a place for engagement. These organizations don't always just talk about themselves, but they have real and human-toned conversations with real people. Social networking is going to happen - Workers increasingly have Internet access on their smart phones. By the year 2013, 43% of global mobile Internet users (607.5 million people worldwide) will be accessing social networks from their mobile devices. 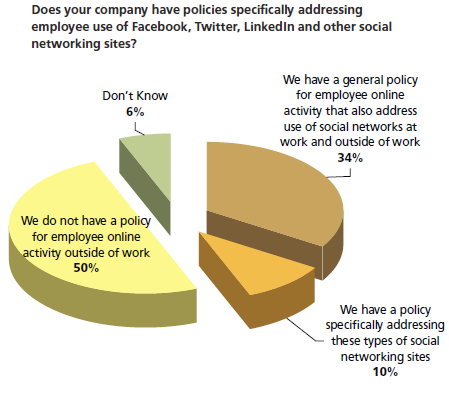 Most employees will use it wisely and for the benefit of the enterprise - Some CIOs fear that social networking would lead to "Networking" instead of doing their jobs. Employees with proper training and guidance will use this new "technology" in ways that will enhance the enterprise's products an services. Social networks actually can make workers more productive - Three out of four of the 895 experts interviewed for the recent Pew Internet report The Future of the Internet IV, said that use of the Internet enhances and augments human intelligence, and two-thirds said use of the Internet has improved reading, writing, and rendering of knowledge. Great ideas are gems that are ready to be found on social networks - Great ideas can come from any level of a company. Using social networks internally (wikis, blogs, forums, even IM) fosters collaboration, and allows workers at all levels to contribute ideas. Employees are trustworthy - Managers worry that employees will leak confidential information, or speak poorly of the company. but with the proper training and procedures in place this is a non-issue. 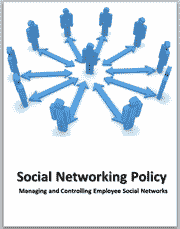 The Social Networking Policy Template is the right tool for this task. With it you can successfully manage and control your employees' activity that are related to your enterprise. Social and business networking sites are changing the way people talk on-line. Sites like Facebook, MySpace and Bebo help friends stay in touch while LinkedIn and Plaxo mainly connect business users. They are very popular but present new challenges to IT managers. These sites are continuing to proliferate. Facebook is the second most popular site in the world and is continuing to grow in popularity with nearly 60% of global Internet users visiting the site in December of last year. The numbers of users on the site in January of 2018 exceeded 2.2 billion, 90% of which were located outside of the US. The rapid growth in popularity and usage of such sites is just part of the problem. Companies unaware of the associated dangers of these types of websites risk getting caught of guard. organization chart and phone directory on the Internet; but a head-hunter or identity thief can use information on social networking sites to reconstruct this kind of information. Sites that allow third parties to run applications that have access to user profiles. This is a potential privacy risk. People publish a wealth of personal information in their profiles. This makes social networking sites a happy hunting ground for identity thieves and con men. There is also a risk to your company's reputation. Social networking is more public and less formal than company e-mail. It is also easier to use than blog software. It's easy to imagine employees posting pictures or text that would embarrass their employer. Viruses and spyware: Social Networking sites often display advertisements.